Well-loved for their creamy white, slender trumpet-shaped flowers, which appear in abundance for several months in summer and autumn, filling the evening air with their heady perfume. They are popular as seasonal bedding and also work well in patio pots where they can be placed next to entrances or seating areas. 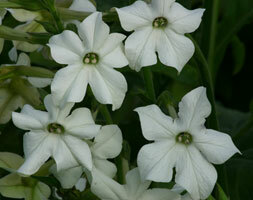 Mainly grown as an annual, this short-lived perennial may survive the winter if grown in a sheltered spot in the garden.